The new tactic of sending kites carrying firebombs over the Gaza-Israel border fence to start large fires in Israel seems to be working. On Wednesday, just before the Jewish holiday of Lag Ba’Omer, one such fire kite landed in Israel and set the Be’eri forest on fire. Due to the strong winds and dry weather that Israel experienced over the course of Tuesday and Wednesday, the firebomb easily caused a large conflagration in the forest and firefighters from the entire region were called in to help stop the blaze. The fire burned dozens of acres of forest before firefighters were able to contain it. The so-called “fire kites” have been a weapon of choice for Gaza insurgents since the protests t the fence began on March 30th, erev Pesach. Hamas has been calling the protests the Protest of Return and claim that the protest will see the return of all Palestinian refugees to Israel. thus far, the fire set on Wednesday was the largest blaze set by a fire kite to date. 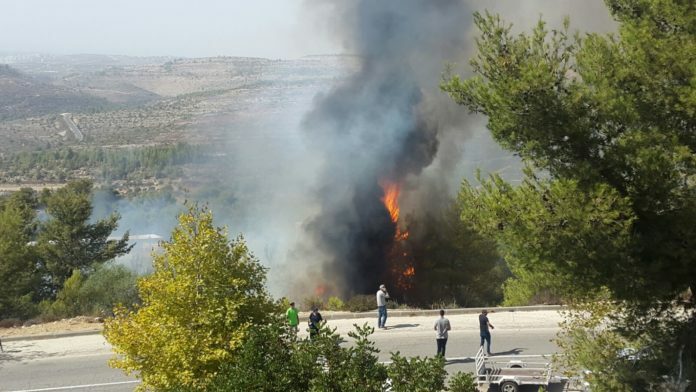 So far, some 86 acres of farmlands and forested areas have been burned by these fire kites and the damage has totaled more than $50,000 according to a recent report in the Jerusalem Post. Head of the Eshkol Regional Council Gadi Yarkoni, demanded that the national government and defense department find a solution to the issue. can’t they fire enough bullets to put enough holes to n ing it down then extinguish the fire?